These are the descendants of Noah. Noah was a righteous man, blameless in his generation; Noah walked with God. Business Books – Borders Bookstore at SeaTac Airport by brewbooks via Creative Commons 2.0. 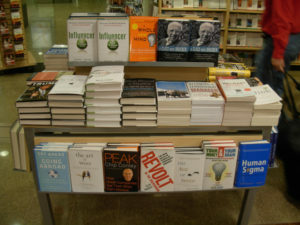 The next time you’re in a bookstore (yes, they still do exist, especially at airports), I’d encourage you to wander over to the business/leadership section and glance through some leadership books. There will be plenty. I guarantee it. In these books you’ll find lots of different qualities that are considered essential for a leader, such as vision, integrity, wisdom, persistence, experience, guts, and so forth. At some point you may want to ask yourself what you look for in a leader. What are the traits and capabilities that you value most of all in those who assume leadership? In Genesis 6, we catch a glimpse of what God values in a leader. This comes in verse 9, in a concise description of Noah. If we’re reading through Genesis for the first time, we don’t know yet that Noah will become a crucial leader in God’s plan for the earth, but we do know that Noah is special. Verse 8 says, “Noah found favor in the sight of the LORD.” Once we have read more of Genesis, we realize that God gives to Noah one of the most important leadership positions in all of human history. His job is to lead both people and animals (!) so that there will be living creatures on the earth after God destroys almost every living thing. What did God see in Noah that set this man apart from all others? Genesis 6:9 explains, “Noah was a righteous man, blameless in his generation; Noah walked with God.” There you have it, in a nutshell. God looks for a leader who is righteous and blameless, and who walks with God. In the next three days, I want to unpack this description with you, considering carefully what Genesis 6:9 tells us about God and leadership. For now, though, I’d like to encourage you to take a few moments to reflect on the description of Noah as it relates to you and your leadership. You might find the following questions to be helpful. What strikes you when you read the description of Noah in Genesis 6:9? What thoughts spring to mind? What feelings do you have? Do you have questions as you reflect on this verse? In what ways are you like Noah? In what ways are you not like Noah? Gracious God, thank you for Noah, who found favor with you. Thank you for the example he set for us. Help us, as we reflect on him, his character, and his mission, to learn more about what you value in a leader. And as we learn, Lord, may we become more like Noah, so that our leadership might honor you. Amen. This post originally published on August 3, 2015.